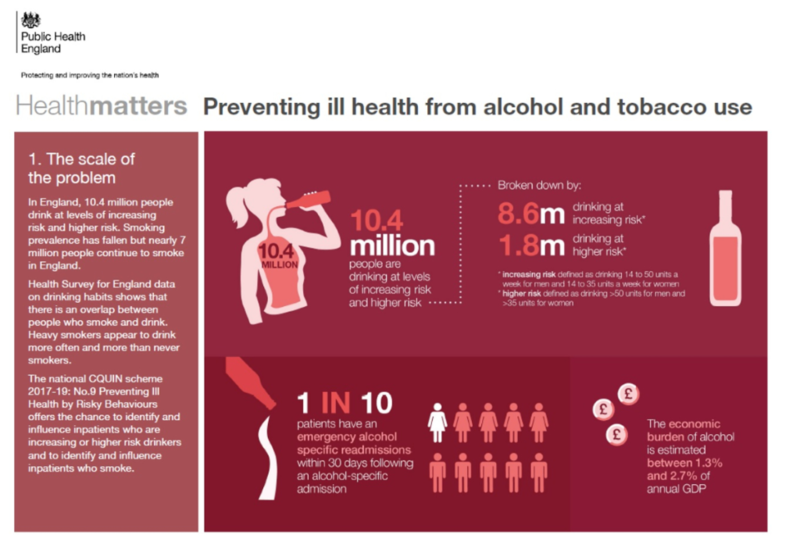 Public Health England (PHE) have released a new ‘Health Matters: preventing ill health from alcohol and tobacco use’ resource calling on practitioners and commissioners to ‘play their part’ in reducing alcohol harms through Identification and Brief Advice. A case study of an IBA CQUIN in mental health settings in South London also provides insight into local implementation efforts. Many local areas will have already been seeking to implement IBA across a range of settings, either via previous locally commissioned CQUINs or other service provider agreements, or perhaps optimistically by simply training staff roles or dissminating ‘scratch-cards’. Other areas may have focused on the embedding digital interventions, IBA across other settings or novel approaches such as IBA direct. IBA has been a central component of alcohol prevention strategies in the UK and in other countries, but whilst there may be good evidence from research trials, the extent of effective routine implementation remains questionable. As such, debates over whether the benefits of brief interventions seen in research trials can be translated to busy front-line settings continue. Indeed such questions may be complicated by the difficulties in researching complex behavioural effects across different settings and population groups, and studies that have had more mixed implications such as SIPS. Certainly then PHE’s recognition of the need to see such a scheme as ‘well implemented’ in order to see the desired effects seems well warranted. 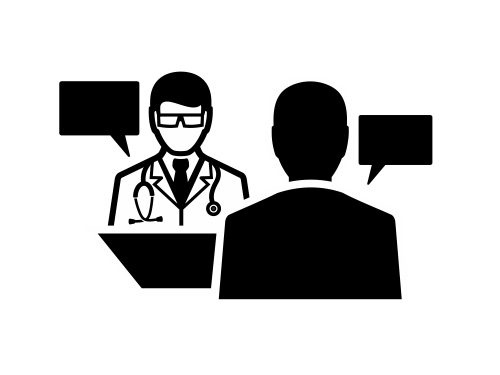 Questions over the actual delivery of ‘brief advice’ conversations beyond simply numbers of people screened or given a leaflet are not possible to answer. Indications from patient studies suggest very few risky drinkers recieve brief advice from their GP practices compared to smokers, despite a national requirement for practices to deliver IBA to new registrations or via health checks. As such calls have been made to do more to consider measures of implementation beyond reported numbers including a ‘national centre’ of IBA, similar to the NCSCT which exists for smoking. 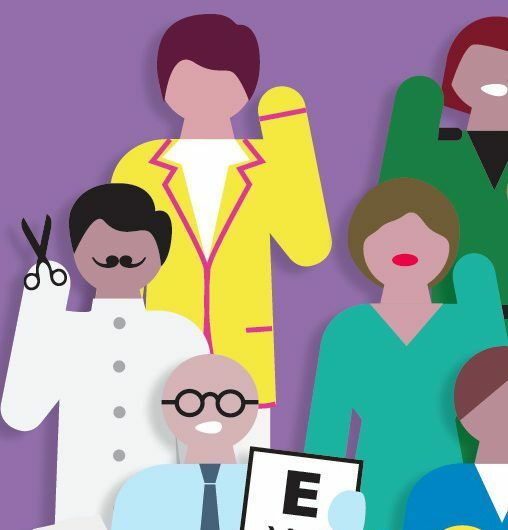 Meanwhile PHE and others have continued to produce resources and toolkits for implementing alcohol strategies which may be seen as important in sustaining local efforts to deliver preventative alcohol interventions, whilst some areas have focussed on ‘Making Every Contact Count’ (MECC) approaches. 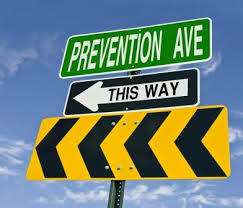 For others the crucial question may be how achievable ambitions to deliver non-urgent preventive interventions are if pressures on front line services continue to mount. The Ministry of Defence (MoD) have released figures on an initiative to deliver alcohol brief interventions across the armed forces via dental check ups, identifying 61% of military personnel drinking at a risky or harmful levels. The MoD has previously come under fire over a lack of action to address high levels of alcohol misuse amongst the armed forces. In 2015 Professor Neil Greenberg, lead on military health at the Royal College of Psychiatrists and a former Navy Commander, said an approach based education alone was not effective. Subsequently an MoD alcohol working group was instigated to “review policy and data to identify what more we can do to tackle alcohol misuse in the armed forces”. Alcohol brief interventions (ABI), often referred to as Identification and Brief Advice (IBA) in England, have been increasingly sought as a strategy to promote behaviour change amongst at-risk drinkers, as advised by NICE and national health bodies. Much debate has been had though over how and where they should be delivered, with question marks over to what extent various national and local efforts may have been successful. The MoD report highlights Armed Forces personnel are expected to attend a dental inspection between every 6 to 24 months, therefore presenting an opportunity to deliver ABI to the whole workforce. The initiative used AUDIT-C, a 3 item assessment tool utilising the first three questions of the full AUDIT. Scores of 5 or above on the AUDIT-C indicate a level of risk and/or harm, though it is considered less effective at distinguishing different levels of risk or probable dependence in comparison with the full AUDIT. The MoD sought to offer all personnel with a score of 1+ (any level of drinking) an alcohol advice leaflet, reporting 80% (n = 80,662) as receiving one. Of the 61% personnel who scored 5-12 on the AUDIT-C, 63% (n = 42,074) were given an ‘Alcohol Brief Intervention’ (ABI), though the report states it is ‘not currently possible to measure how many of these ABIs have been delivered’. Indeed a key question for all ABI initiatives has been to what extent the reported interventions have been delivered, particularly in view of time time limitations and other issues such as a lack of training. For those scoring 10-12 on the AUDIT-C, a total of 2% (n = 2,502), the MOD states personnel should have also been ‘advised on the importance of seeking further advice from their GP or a local alcohol support service’ in addition to the ABI. Overall, higher alcohol risk levels were associated with being young and single, being of more junior rank and being of white ethnicity, with navy personnel indicating the highest AUDIT-C scores. Will dental ABIs reduce alcohol misuse in the military? The report states the MoD is undertaking other initiatives to reduce alcohol misuse, including ABI beyond its dental settings. Measuring the specific impacts of such schemes is notably difficult, though having such data on the levels of alcohol misuse may prove useful data for any future evaluation. However as with wider debates over approaches to reduce alcohol misuse, researchers tend to highlight the need for ‘multi-component’ programmes and supply side controls rather than relying on single initiatives to have a sustained impact. The MoD’s alcohol working group is likely to face many specific challenges in shifting what MPs have described as a heavy drinking culture within the armed forces. The availability of subsidised alcohol, attitudes and expectations of personnel towards alcohol and the many other complex factors influencing health and wellbeing are all likely to play important roles in seeking such changes. Observers may see a committent to ABIs as welcome, but will hope that they are not relied upon as the sole strategy for addressing alcohol misuse in the military services. See the MoD report here, or a 2013 letter in The BMJ’s Journal of the Royal Army Medical Corps and a 2011 report on ‘Alcohol use and misuse within the military: A review’ [pdf]. Results from the 2015 British Social Attitudes (BSA) were recently released, revealing the vast majority of patients felt either fairly (20%) or very comfortable (75%) talking to their doctor about their alcohol consumption. Just 2% of respondents were either fairly or very uncomfortable doing so, suggesting there is little justification for the commonly perceived barrier that patients may be defensive when offered brief intervention. A further 3% said they did not feel either comfortable or not. Furthermore over four-fifths (85%) of people say that they “would answer completely honestly”, while 14% say that they would “bend the truth a little”. Whilst the study found people were more likely so say they would answer honestly if they didn’t drink or were lower risk drinkers, 62% of risky drinkers still said they would be truthfull. This may in part be because many at-risk drinkers are not aware of their drinking as such, but still the results suggest a widespread public acceptance of the role of IBA in health care settings. Unfortunately, despite ongoing efforts to incentivise and support Primary Care roles to deliver IBA, less than 10% of at-risk drinkers report recieving alcohol advice, compared to over 50% of smokers. 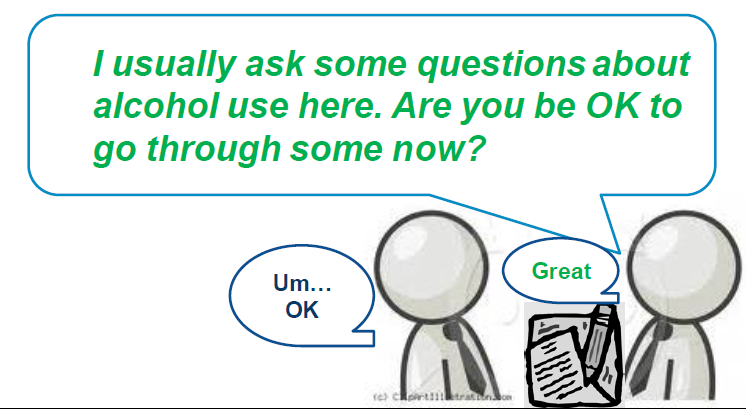 Despite such a high percentage of patients being comfortable to discuss their alcohol use, it is important to note that how such questions – and any subsequent ‘advice’ – is carried out is crucial to the effectiveness of brief intervention. One of the most important things is to ensure patients do not feel they are being judged or picked out individually for alcohol questions. Whilst many practices screen patients at certain points, initiating IBA can be done whenever a spare moment arises. Patients of course do have the right to decline, and any following conversation should not be pushy or lecturing. Delivering a validated alcohol assessment such as the AUDIT and offering brief feedback on the person’s score appear to be the most important elements – Primary Care roles musn’t think that patients are against this. A series of reports are available following the conclusion of a Middlesex University project exploring the delivery of alcohol brief interventions outside of health settings. A growing effort to deliver alcohol ‘Identification & Brief Advice’ (IBA) in a range of different settings has emerged over the last decade, but the actual level of delivery by front line practitioners remains questionable. The reports appear to confirm many of the suspected reasons why IBA delivery has proven difficult, ranging from individual level perceived barriers to failures to adopt ‘system wide’ approaches. To those in the field, it may be no surprise that simply ‘parachuting’ in training without recognising and addressing many of the contextual issues at play is insufficient. Despite this, training is likely to be an important component of any efforts to secure delivery, and participants generally value the knowledge and skills gained. Different roles in different settings though report varied barriers and opportunities and so training and all important organisational strategies may need to reflect these nuances. The main report looks at these through work on influences on behaviour change undertaken by Susan Michie and colleagues at UCL. 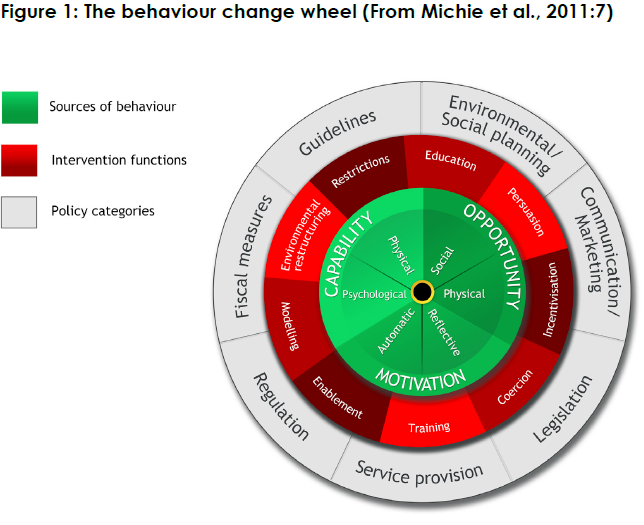 Whilst the more traditional ‘cycle of change’ is often used to consider a drinker’s motivation to change, Michie’s work demonstrates the importance of considering the wide range of factors that influence practitioner’s behaviour as potential IBA agents. For example training may address a practitioner’s ‘capability’, but may not address key issues of ‘opportunity’ (e.g when is ‘identification’ actually going to be feasible) or ‘motivation’ (perhaps recognition of doing IBA or personal satisfaction). Other questions addressed in the research include important questions such as whether in fact IBA should be pursued in various non-health settings. A ‘health in all polices’ approach may be sound, and other added benefits such as possible impact on important indicators like re-offending rates or housing status could also be seen. Yet the evidence base proving the effectiveness of IBA in non-health settings is rather sparse. Given that seeking to secure routine IBA delivery even in health settings includes a range of distinct challenges, any help knowing where else and how IBA will be most effective will be particularly welcome. See here to access the full suite of publicaitons. The two sided ‘IBA tool’ appears to have been a popular resource amongst roles delivering IBA, so PHE have released an updated version following the recent change to the recommended guidelines. ‘Feedback’ – the tool has several sections that may help the drinker understand what their level of risk is and what that means. 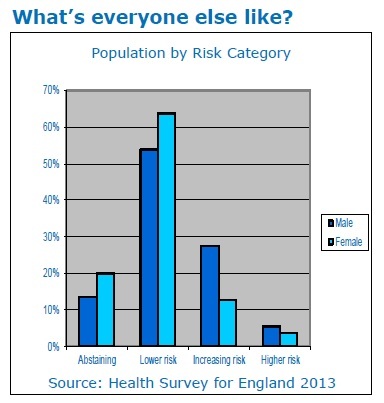 The ‘risk category’ table gives an indication of what that may look like in terms of units, whilst the population graph (right)is thought helpful to highlight most people actually drink at ‘lower risk’ amounts. ‘Advice’ – practitioners should of course be careful here. Rather than giving direct ‘advice’, generally better to ask “could you think of any benefits if you did decide to cut down?”. The tool suggests some ‘common benefits of cutting down’ which can be useful prompts. ‘Menu’ of options (goals or strategies) – as above, best to ask “would any these strategies listed here be useful if you did decide to cut down?”. Easy to assume what works for you will work for them, but important they ‘own’ their responses as much as possible (Responsibility). Not forgetting of course ’empathy’ and ‘self-efficacy’ as the final FRAMES elements – not on the tool because these are skills we try and embed throughout brief intervention – and probably at other times we are in contact with people. As such the evidence behind FRAMES as central to IBA is often questioned, but in a general sense it may be considered useful as a guiding framework. What about the tool itself? It is of course impossible to build the ‘perfect’ one size fits all tool when people and drinking motivations are so varied and complex. This is why the tool should just be an aid to facilitating person-centred IBA, rather than the focus. Interestingly, PHE have done away with the old ‘large white wine’ with 3 units on the side. This is a good move as people frequently commented on the drink’s visual appeal. Indeed a ‘priming’ effect has been found in studies and is one of the reason why ‘responsible drinking messages’ with pictures of alcohol are controversial. Weren’t thinking about wanting a drink? Perhaps you are now you’ve seen one! It’s replacement though is the new ‘One You’ campaign promoting healthier living in general. I’m not quite sure on how I feel about this yet, although I do agree alcohol brief interventions need to be considered as part of wider health behaviour initiatives. One thing that could still probably do with updating is the unit examples. ‘This is one unit’ contains some rather dubious examples – when was the last time anyone was served a 125 ml glass of wine at only 9% ABV? Certainly far less often than a 250 ml 14% one, registering at a considerable 3.5 units. However these finer points may not be that important when considering the likely impact. We know ‘identification’ and ‘feedback’ are most likely to be the critical ‘active’ elements of IBA, complimented by conversations that feel helpful and supportive to the drinker. Such resources are probably more important for nudging and helping practitioners to start these valuable conversations.